As semiconductor nanowires emerge as indispensable building blocks for next-generation electronic, energy conversion, and photonic devices (i.e. solar panels, lasers), better understanding how to direct nanowire growth is vital, according to Georgia Tech researchers. Many orders of magnitude smaller than household wires, nanowires can be made from a variety of semiconducting materials including germanium and silicon. For years, the synthesis of nanowires has been somewhat mysterious, requiring scientists to experiment with reactor settings, modulating temperature and pressure, to see what would work best – a slow, arduous process of trial and error. "It's been like cooking something in the oven without ever being able to look in until it's done hours later," explains Michael Filler, associate professor at Georgia Tech's School of Chemical & Biomolecular Engineering. 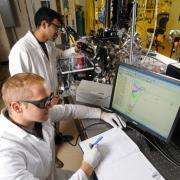 However, a team working in the Filler Laboratory has gained unprecedented insight into the nanowire growth process through the use of real-time infrared spectroscopy. They found that surface species, specifically hydrogen atoms and methyl groups, decorate the nanowire's surface and are essential for the stable growth of nanowires made from germanium. According to the study's findings, without the presence of hydrogen and methyl adsorbing (or adhering) to the nanowire sidewalls, the liquid droplet that sits atop the nanowire could slip, causing growth to cease. "These surface species, hydrogen and methyl molecules, act like a layer of Rain-X, keeping the droplet in place," Filler explains. "Our work shows that without these surface adsorbates, growth doesn't happen. No one knew that before," says Filler, whose research team published its findings in a recent issue of the Journal of the American Chemical Society. "For as long as scientists have been using this growth method – more than five decades – we didn't know that anything was present on the wire surface." Now that the scientific community is aware of this key aspect of nanowire synthesis, researchers will be able to better design processes and precursors to choreograph nanowire growth, Filler says. As obstacles to the production of nanowires are overcome, they can be manufactured on a greater sale and incorporated into commercial products. "The fundamental chemical knowledge provided in our study promises to advance the rational synthetic design of nanowire structure and function," Filler says. Titled "Direct Observation of Transient Surface Species during Ge Nanowire Growth and Their Influence on Growth Stability," the study was led by Saujan V. Siveram (PhD 2015) who collaborated with Filler, Naechul Shin (PhD 2013), and Li-Wei Chou, a former postdoctoral researcher at Georgia Tech. Filler says their experiments provide insight into, and propose possible solutions for, long-standing challenges in selecting materials that catalyze the nanowire growth process; the delivery of impurities (e.g. phosphorous, boron) that influence electrical conduction; and the formation of heterostructures on or within nanowires, enabling better and possibly new combinations of materials.